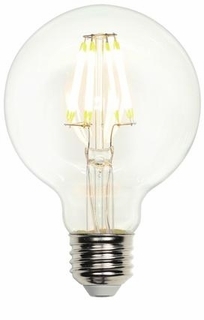 Westinghouse LED 7-1/2W G25 Globe Dimmable Filament LED Light Bulb - Description: The Filament LED Globe is an energy-efficient, dimmable LED light bulb ideal for everyday use. The Filament LED bulb combines the traditional look of the Globe shape light bulb with all the benefits of LED technology. This 5-watt bulb can reduce energy and operating costs up to 87 percent compared to a 40 watt standard incandescent bulb with the same brightness. With a life of 13 years/15,000 average rated hours, the Filament LED Globe light bulb offers long-term use and dependability.